Blimey, it’s hot – 25 degrees today. The french doors in the kitchen of our guesthouse in Eastbourne are wide open and the high ceilings offer hope of cool air, but the contrast against recent temperatures couldn’t be more stark. The morning has been spent on the beach – with our boy enjoying the first dip of the year on Eastbourne beach. Smartphones mean that you can capture everything. Certainly enough video footage to make Raffy squirm in 15 years times when it’s revealed to his girlfriends. And then back to dress and grill 6 fresh mackerel caught from the pier yesterday and donated by one of our guests so a lovely lunch for the whole family. We have 4 Aussies staying here for a few days and even they grudging admit it’s hot – which surely means that summer is finally here. I actually hope it cools down a little for them as they’re heading down the south-west to start a Lands Ends to John O’Groats bike ride. Good on yer, fellas! Prospects are also hotting up for the tennis at Devonshire Park in Eastbourne, with the start of the grass court season – Caroline Wozniacki is certain to return and there’s a cracking line-up for the Fathers Days Legends with Greg Rusedski and Mark Philippoussis confirmed, as are Martina Hingis and Conchita Martinez. 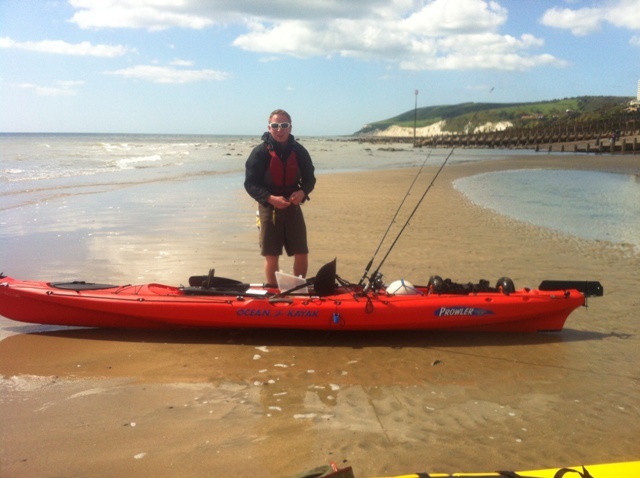 The weather forecast is set fine and warm all week so ample time for me to get the kayak out again and head out fishing for some mackerel and maybe, just maybe, I’ll see the return of some bass.